We were delighted to help James. He is a 2 year old boy with severe cerebral palsy, spastic quadriplegia. He is at great risk of spinal and hip deformity without the use of 24 hour positioning equipment and we were quickly able to offer funding to keep James safe and happy. As you can see, the lying board enables him to be symmetrically positioned and keep his head in midline when he is out of his wheelchair. 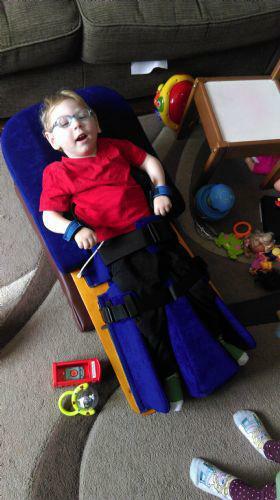 This allows his parents to put him down on the floor knowing that he is safe and well positioned. He is also able to play with his sister Hannah as she can bring toys to him at a level that he can see.